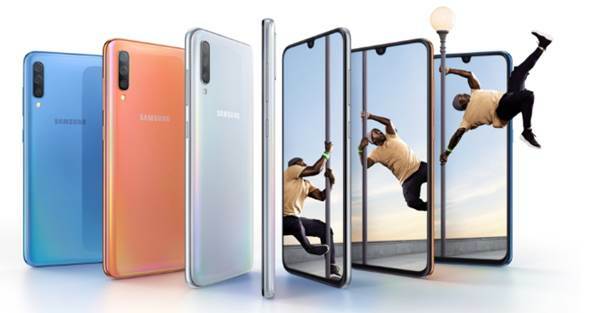 Samsung has revealed today Galaxy A70 smartphone which will be officially launched on 10th April in three different continents when the price of this device will be announced. Highlights of Galaxy A70 are its FHD+ AMOLED Infinity-U Display, In-Display Fingerprint Sensor, massive 4500mAh battery, triple rear camera of 32MP +5MP+8MP and front camera of 32MP. This phone will be available in four colors of – Coral, Blue, Black and White. This phone has 3D Glasstic body with a stylish prism effect that reveals stunning gradient colors depending on light direction and reflections. On the specifications front, the Galaxy A70 sports a 6.7-inch (2400 x 1080 pixels) Full HD+ Infinity-U Super AMOLED display having an aspect ratio of 20: 9. This phone is powered by an octa-core chipset and is combined with 6GB/8GB RAM and storage of 128GB which can be further extended upto 512GB via microSD card. This is Dual SIM phone and is packed with 4500mAh battery with 25W super fast charging. For security, the Galaxy A70 has face recognition and on-screen fingerprint scanner. Paired with Samsung Pass, people can sign into websites and apps by using biometric authentication as an easier and more secure way of logging-in. This ease and convenience is enabled by Samsung Knox, Samsung’s defense-grade security platform designed to protect from chipset to software. This phone runs Android 9.0 Pie with Samsung One UI on top which has many features such as One Handed Navigation for ease of use, Night Mode to switch the display to evening time viewing and get more control over screen time with App Timer that gives visibility over your screen usage levels. It also includes Samsung Health, Samsung Pay and Bixby. 32MP primary camera with LED flash and f/1.7 aperture, secondary 5MP depth sensor and 8MP Ultra Wide Lens. For selfies, this phone has 32MP front shooter with f/2.0 aperture. More details of this phone and pricing would emerge on 10th April. We shall update the same the moment these details are available with us. Stay Tuned!